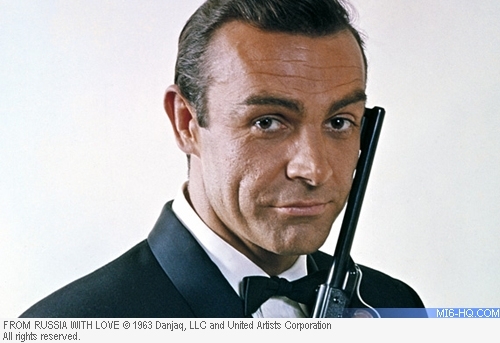 The success of "Dr No" (1962) virtually demanded that James Bond return to our screens as soon as possible. Saltzman and Broccoli were suitably impressed by their first film's tremendous performance to plan the follow-up to be as big as they could make it. The choice of book to adapt was no doubt influenced by the fact that in March 1961 President John F. Kennedy had named From Russia With Love as one of his ten favourite novels. Following Kennedy's endorsement, Stateside sale of the book had rocketed and Saltzman and Broccoli were quick to realise its potential. Above: Sean Connery as James Bond. Assembling largely the same crew, Saltzman and Broccoli set to work almost immediately after the release of "Dr No". The core cast was reassembled during the early months of 1963 as Richard Maibaum and Johanna Harwood thrashed out a screenplay that remained remarkably close to Fleming's original. The cast and crew converged on Pinewood on 1 April 1963 where director Terence Young filmed Bond's arrival in M's office and shot the first scene of many to feature Desmond Llewelyn as gadget king Q. Llewelyn had already worked with Young on the war film "They Were Not Divided" (1950) and was to stay with the series until his death in 1999, shortly after his 17th appearance as Q in "The World Is Not Enough" (1999). On 12 April 1963, the production headed outside but didn't have far to go - Pinewood's main administration block stood in adequately for the SPECTRE training grounds seen in the teaser. Much of this footage later had to be reshot, however, when Young felt that the extra playing the SPECTRE agent disguised as Bond looked a bit too much like Sean Connery and was likely to cause confusion. 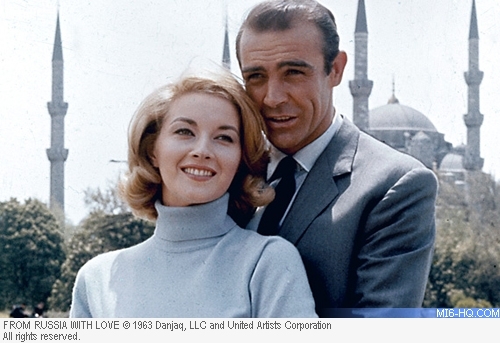 The increase in budget allowed EON to spread their wings a little and "From Russia With Love" was the first in the series to adopt the now familiar and expected globe-trotting from Bond. While a second unit crew toiled away in Pinewood, the main unit relocated to Turkey on Saturday 20 April, beginning shooting in Saint Sophia on Monday 22nd. Ian Fleming went with them, staying as a guest of Terence Young. 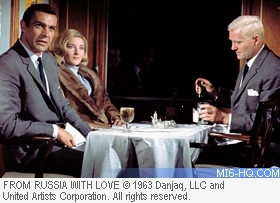 Above: Italian actress Daniela Bianchi as the beautiful Russian operative Tatiana Romanova. For this film, Peter Hunt - again signed on as editor - worked more closely with Young and even shot insert footage to help increase the tension in the teaser and carefully trimming and cutting several of the film's key scenes in close collaboration with the director. 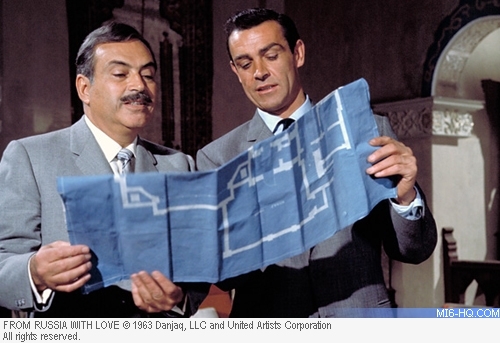 By May, however, it was becoming clear to all involved that things were not well with co-star Pedro Armendariz, cast as Bond's Turkish contact Kerim Bey. Armendariz had been recommended to Young by the veteran American director John Ford and Young had been keen to give the experienced actor a try. However, as filming progressed, Armendariz had developed a nasty limp and was soon feeling unwell. A check up confirmed the worst - the actor was suffering from cancer and so bad was the disease that by now only regular shots of morphine could kill the pain. It later turned out that Ford had known that Armendariz was dying and had helped him to get one last job on a prestige production so that his wife would have some money after his death. Young was now forced to reschedule much of the shoot to make sure that the ailing Armendariz would be able to complete his scenes. 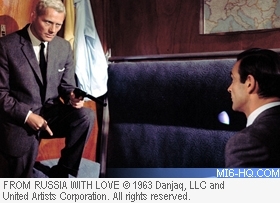 By the second week in June, the actor's work on "From Russia With Love" was complete. Now confined to a wheelchair, Armendariz was guest of honour at a party held on Sunday 9 June by Young. On 18 June, Armendariz committed suicide while in hospital in Los Angeles. By this time, however, Young had other things to worry about. Filming in Turkey had presented problems all of its own, many of them stemming from the inexperience of local crews and their inability to meet the standards set by Young and his crew. The sequence at Istanbul's Sirkecki Station, for example, was a nightmare to shoot. Generators had to be set up aboard the train being used for the sequence and left in the hands of a Turkish engine driver who was supposed to pull into the station and hit a predefined mark. The engineer constantly overshot the mark, snapping the generator cables and plunging the location into darkness. There were even worse problems during the climactic boat chase sequence. 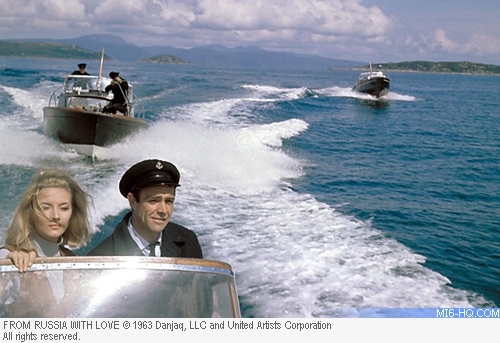 The speed boats constantly broke down; Turkish production assistants put kerosene in the tanks instead of gasoline; the weather was inclement; Daniela Bianchi was struck down with seasickness; and eventually an exasperated Young decided to call it a day and abandoned the location at Pendik in Turkey in favour of Scotland. But even there, the problems didn't end - while shooting on location at Kilmichall and off the coast of Crinan, a series of potentially lethal accidents befell the crew. During the boat chase, the fireball from the exploding gas canisters almost got out of hand and that's very real fear on the faces of the pursuing actors! It was the helicopter sequence near the end of the film that posed most of the problems, however - tragedy struck one camera operator whose leg was hit by the blades of one helicopter that came in too low and he had to have his foot amputated. Connery too came close to death when an inexperienced pilot flew a little too close, almost killing the star. Even Terence Young almost came to a sticky end in a helicopter - shortly after take off while shooting at Crinan, his helicopter's engines failed and the aircraft crashed into the sea. Young barely managed to escape with his life, clawing his way out of the helicopter from ten feet underwater. In less than an hour, he was back on the set! Saltzman, understandably nervous about all this, asked veteran British director David Lean to step in and take over the production, but Broccoli was made of sterner stuff and recommended that Young be allowed to complete the film. By 23 August 1963, despite all the setbacks, principal photography was complete, though Young had to travel to Venice to do some final pick up work for the back-projection shot seen at the very end of the film. Due to all the problems during the shoot, time was now running out and the delivery date for the film to be handed over to United Artists was fast approaching. Reluctantly, Saltzman and Broccoli had to give up plans to use another of the animated title sequences created for Dr No by Maurice Binder and Trevor Bond and had instead to use a simpler but no less effective one created by Robert Brownjohn. The gyrating belly dancer with scenes from the film projected over her body was to prove an inspiration to Binder whose trademark cavorting title girls were soon to become synonymous with the series. The film was given its first press screening at the Leicester Square Odeon on 8 October 1963 and this time, the response was much more like it. Though the British press had been quick to denounce Dr No, they turned up in droves to see the latest 007 adventure - Alexander Walker of the Evening Standard recalled the vociferous response from the Fleet Street hacks who yelled and applauded "every feat of matchless courage and stunning bedroom virility that our man pulled off." David Robinson in the Financial Times was gobsmacked by the "mass exhalation of indrawn breath from the auditorium" following Bond's brutal tussle with Grant aboard the speeding train. Sadly, none of this enthusiasm was that evident in the published reviews and John Trevelyan, then secretary of the BBFC, was to have a rough ride at the hands of the press who questioned his judgment in allowing such a violent film to be released. But, as ever, the public knew better and the film was another massive success. On 10 October, Kinematograph Weekly was forced to admit that "crowds had been gathered at the theatre since mid-day. By early afternoon it was obvious the opening day house record was going to be beaten - it was just a question of by how much. Saltzman, Broccoli, Connery and Bianchi mingled with assorted lesser royalty and a smattering of celebrities to attend the opening night to see that, yes, their latest offering was indeed going break those house records. 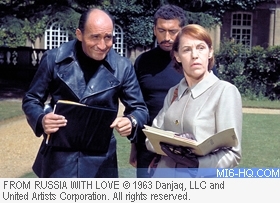 And "From Russia With Love" would continue shattering house records wherever it played. It even turned up in the Kremlin when Soviet premier Leonhid Brezhnev obtained a print from the British embassy and supposedly watched it no less than three times.